A Large, Ergonomic Sponge With Built In Soap. The Convenient Way To Clean Your Body. Olive oil, Prickly Pear extract and Shea Butter are infused into a large, ergonomic sponge to create this convenient cleaning tool. Simply get it wet in the shower, and then squeeze to create a lather. The premium soapy ingredients will generate a thick foam with incredible cleaning power, and the spa quality sponge adds a massaging and gentle scrubbing effect that only adds to the efficiency. The large, round shape is incredibly comfortable to hold, and the ample surface area allows you to clean more skin in a shorter amount of time. Get at least twenty uses out of this amazing product before the soap runs out, and add your own after that to continue using the blue sponge. The 4-in-1 combination of ingredients will enable you to clean, protect, massage and hydrate your skin in one easy step, so your body will look and feel better than ever. 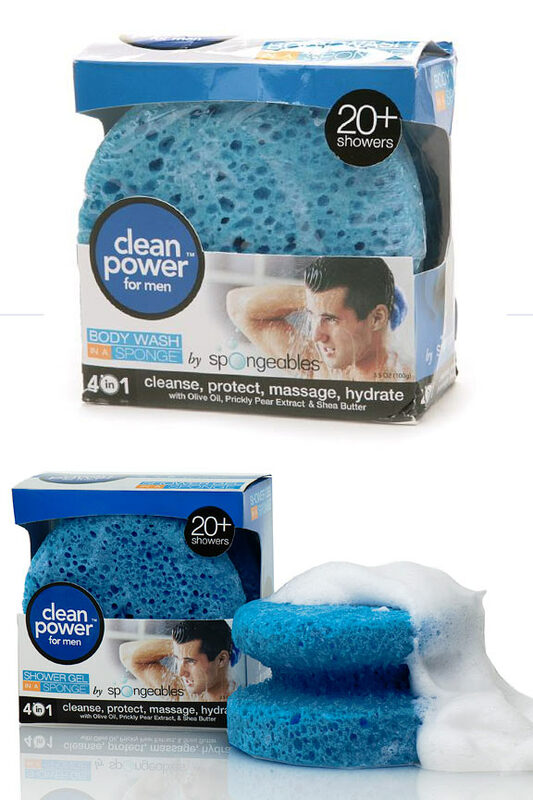 The clean power fragrance is manly enough to make it OK to wash with a sponge, but not so overpowering that it seems like you're trying too hard. Want a smaller one to try first? Need a more compact version to take with you while traveling? Check out the 5+ travel size version for the same thing in a more compact package. Stop washing with a bar of soap alone, but don't waste time combining two products while in the shower. You may not want to be caught borrowing your wife's poofy thing, but you might enjoy the gentle scrubbing action it provides. This high quality cleaning tool will give you all of the same benefits, but in a less embarrassing, and more masculine package. The time release action will build the perfect amount of creamy lather as it uses just enough soap for a single wash. This version is rated for twenty or more uses, and most people find that they usually last much longer. There is no special steps to take, and using it could not be more simple. Instead of wasting time pouring shower gel onto a wash cloth or sponge, you simply get this one wet and start washing right away. It is equally convenient to using a bar alone, but it will provide way more cleaning power, and because it has better ingredients than most, it will also protect your body and leave you feeling more hydrated when you finish. Get the cleaning power of a premium grade body wash, and a spa quality sponge in one. Using is simple and convenient. Simply remove from packaging to get ready. Get into shower or bathtub, wet your body and then saturate the sponge. After adding water, give a gentle squeeze to produce lather. Once sponge is coated in bubbles, you have plenty of soap to wash. Because it is infused, as you clean, more soap will add as needed. Wash all over like normal and the texture of the tool will gently scrub and massage to increase enjoyment and cleansing ability at the same time. This version is rated for at least twenty uses, but most people get more. Exact length of use will vary slightly. Sponge remains useful when soap runs out. Add additional soap or body wash to keep using it. Once you are clean, rinse away soap from skin, then rinse excess soap from sponge. Squeeze to remove any extra water. After you are done, place anywhere to dry for later use. Dimensions 4.25" x 4.25" x 2.5"
# Uses 20 or more. 4-in-1 Yes. Clean, protect, massage and hydrate in one easy step. Ergonomic Shape Yes - round shape and curvy handle portion make it easy to handle without strain. Clean and protect your skin for more than two weeks with this convenient product. Time release soap is infused into the sponge material so the perfect amount of lather is released with each use. Premium ingredients ensure clean skin, moisture retention and long lasting moisture. Order Yours Today! I love these sponges. After the impregnated soap is used up after a few weeks or so, it will take any body soap applied daily and wash well, lasting about 5-6 months. A really good product. The delivery was speedy, the price very fair and and the quality of product still excellent. It has been extremely difficult to find this item. My husband and boys swear by this spinge and were starting to panic when stores stopped sellibg it and it disappeared inline too. We thought it had been discontinued. Highly recommended for men working in construction. Started ordering these sponges three years ago for my son when he was living in a college dorm. He loved the convenience of the sponge because they are infused with soap. He could easily take them out of the shower so they would not be used by anyone else. He has continued to use them even while living alone. I bought this sponge for my son for his birthday. He is not one to be using heavily scented things and he really is enjoying this sponge for men. He likes that it has one side buffer. It rinses off clean leaving skin very clean and smelling fresh. He will be purchasing more from the company. My husband has used these sponges for over a year and where I used to buy them from no longer handle them. They get rids of pimple and dry skin. Has a very pleasant smell. Loved the product and hope you continue carrying them. Thank you. I have been buying these sponges for my son who is 15 years old now for a good few years now. He really likes them. They smell terrific. They last way longer than they state. Loaded with soap. They start off very stiff because they have lots of soap.and get softer. These kind of sponges do that. We also use the ones for woman. My daughter loves those. Is it possible to refill the sponge when depleted? It will still be quite usable as a regular sponge, but it would be tough to infuse more soap like when they are new. 5+ Size - Same thing only smaller. Take one with you while traveling. All Spongeables - Browse the full line of products. What Are They? How Are They Made? - Discover the technology and ingredients that go into making this great product. Bathroom Stuff - Find other good stuff for your bathroom. A Large Container of The Best Natural Bathroom Cleaner Available. Eliminates All Dirt In Seconds. Professional Strength And Extremely Safe. pH Balanced Shampoo And Sponge In One! Wash Your Pet The Easy Way.